So it’s Friday evening here on the great sushi carousel of Tokyo. 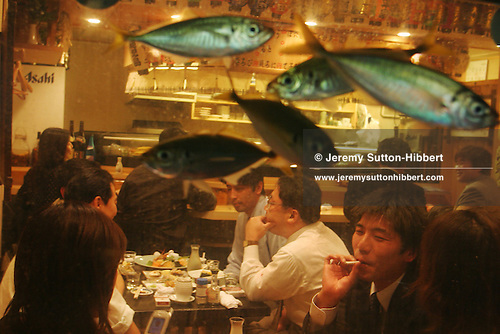 Another week of assignment photography in Japan draws to a close. It’s that time of the week when people go out and party, another week of salarymen life over. I don’t know if it was a Friday night when I shot this above image, but it was in Kabukicho, Tokyo, and it was an evening of socialising with a client in GoldenGai street. On the way home, with my eyesight slightly in need of autofocus, I somehow found the above scene, of a fish tank and view into the izakaya bar. I shot half a dozen frames or so, with the fish in various positions and catching the light to various degrees. And out of those 6 or so, this was the most balanced for the fish composition and they way they shined. I’ve always liked this image. This image as well as all images on my main website, or on my archive site, are available for purchase as fine art prints. Should you have any questions please just ask, many thanks. With a twist in the tail – one could ask who is in the bowl…..the fish or the people. Thanks ! I never thought of it like that before…. Cheers Paule !! Hope all is well….and the book is doing well.